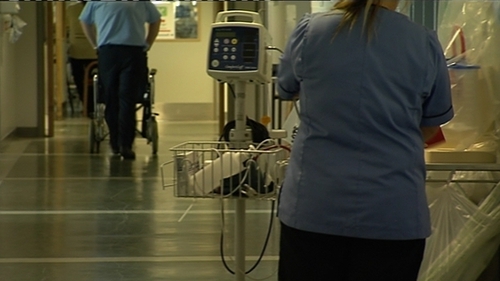 The HSE is hiring 1,000 agency nurses per day at premium pay rates to plug staff shortages in the health service, according to the Irish Nurses and Midwives Organisation. Speaking after talks with the HSE and the Department of Health aimed at averting a threatened nurses' strike, INMO General Secretary Phil Ní Sheaghdha said the management side had today confirmed that the recruitment and retention problem was so acute, that it required them to spend what she called "excessive" and "nonsensical" amounts of money to hire more expensive agency staff. She said the State should not be wasting money supplementing the system when the remedy available to them was to pay nurses and midwives correctly in order to retain them. She reiterated the INMO's belief that nurses can be given special pay rises under the terms of the current public service pay agreement without triggering knock-on claims. The INMO has given the HSE two weeks to come up with what it calls "realistic proposals" before it ballots for 24-hour stoppages. The union overwhelmingly rejected proposals from the Public Service Pay Commission for a €20m package of allowances targeted at the sectors experiencing the worst staff shortfalls, as did the PNA. Unions argue that only an across-the-board pay rise of up to 12% would be sufficient. Asked about the Psychiatric Nurses Association (PNA) demand for a "fairly substantial down payment" linked to a three-month review process to address outstanding pay issues for nurses, Ms Ní Sheaghdha said her union was seeking parity of pay for nurses and midwives with other allied health professionals in the health service - and that that was within the gift of the employer. Ms Ní Sheaghdha noted that the Taoiseach himself had acknowledged this week that to keep beds open they needed nurses at work - but said they did not have those nurses due to a losing battle on recruitment and retention. She said pay needed to be corrected if there were to be any chance of competing with other countries who were recruiting very good Irish nurses. Meanwhile, sources in health management said the bottom line was that they have nothing to give to the nurses. One source said it was a choice between throwing out the public service pay agreement or antagonising nurses. It is understood that the management side will revert to the unions on Tuesday, and a meeting has been scheduled for early on Wednesday morning.